Jen is the author of “Conjugation,” which will be included in our upcoming anthology, SmokeLong Quarterly: The Best of the First Ten Years. 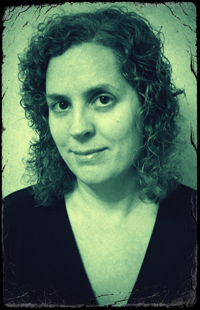 Jen Michalski’s novel THE TIDE KING was published by Black Lawrence Press (2013; winner of the Big Moose Prize). She is the author of two collections of fiction, CLOSE ENCOUNTERS (So New, 2007) and FROM HERE (Aqueous Books, 2013) and a collection of novellas, COULD YOU BE WITH HER NOW (Dzanc Books, 2013). In 2013 she was named one of “50 Women to Watch” by The Baltimore Sun and won a “Best of Baltimore” for “Best Writer” from Baltimore Magazine. Her fiction has been nominated for a Pushcart Prize. She is the founding editor of the literary quarterly jmww, a co-host of the monthly reading series The 510 Readings in Baltimore, and interviews writers at The Nervous Breakdown. I love the emotional payoff in flash, a moment that seems innocuous but is actually volatile. I want to be in the room and feel the need to duck, or I want to come in afterwards and pick up the broken pieces, aware of their potential to still cut me. Every word in flash is important; please choose carefully.